Radio personality Samille “Sami” Muirhead, and her husband Sam Bohner, welcomed their son August Louis, nicknamed “Augie” on August 1. 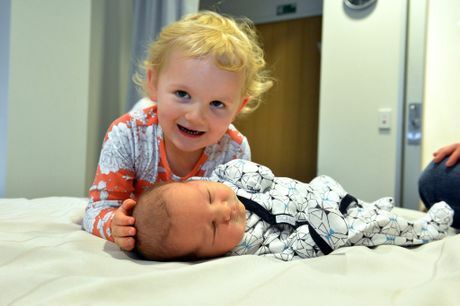 August was born at 7.47 pm at Sunshine Coast Private Hospital; he joins big sister Avalon, aged 3, and big brother Nixon, aged 21 months; Nixon’s birth was announced on the blog. August’s name is inspired by his date of birth: he was born on the first day of the month, and August 1 is the day officially designated as the birthday of all horses in the southern hemisphere. As you may know, 2014 is the Year of the Horse in the Chinese calendar, so August is born on the “Day of the Horse” in The Year of the Horse! Could they pass up that opportunity? Nay! August’s middle name, Louis, is in honour of someone very special – the family’s much loved pet shih tzu. August’s sister Avalon was quite sure that he was going to be a girl, and had already chosen the name Rosie Swimming Pool for her new sister. Apparently she has suffered a genuine disappointment that her name choice won’t be used. Perhaps Avalon will be one day start her own name blog.